It's seems counter-intuitive that the most individualistic generation, the current generation of young people dubbed Generation Z, is also the most vulnerable to recruitment by both Antifa and ISIS. 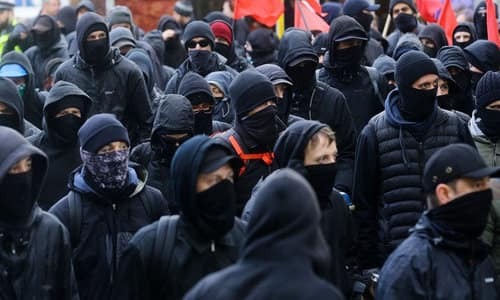 Antifa is a militant, "anti-fascist," left-wing extremist movement classified as a domestic terrorist group when engaging in violence. ISIS is the notorious global death cult trying to resurrect an Islamic State. What could a "disruptive organization with a tendency for violence during protests and riots" have in common with what can be classified as a "paramilitary religious group that does beheadings," and why would they both target Gen Z? According to counterterrorism analyst Oz Sultan, Antifa and ISIS use similar recruiting tactics. In a conversation with Clarion Project, Sultan informs that both groups "prey on Generation Z and millennials who are looking for groups to belong in, while altering their outlook and selling them a hate ideology found in both ISIS and ANTIFA." Most people are familiar with the term millennial, classified as those who were born in the 1980s until the mid-'90s. Generation Z can be classified as those born between 1995 and 2015. - By 2020, the percentage of Americans falling into a Generation Z bracket will jump from a quarter to a third of the total U.S. population. While both generations are of the internet age, there are a couple areas where Generation Z is more distinct than millennials, which impacts recruiting strategies and recruiting vulnerability of this group. Generation Z has shorter attention spans in part because they're more entrenched in the internet age and process information faster than other generations. Also worth noting that this is the generation most dependent on and addicted to smart technology, including smart phones and other internet portals. Antifa and ISIS operative heavily within the internet. The internet is where they're most prominent in recruitment and propaganda dissemination. Generation Z are "early starters," which means that they are more informed of traps that other generations have fallen into including student loan debt. They also are more inclined to reject trying to climb corporate ladders or self-initiate hamster-wheel career roles that demand monotony and routine without reward or employer loyalty. This means this generational group is more prepared to abandon traditional roles that lead to higher education or work opportunities that don't allow for flexibility or horizontal career planning. In short, Generation Z is open to alternatives. Where an extremist organization can feed into their grievances or offer a new pathway, Generation Z will be most open to another way of life, another ideology or tribe to belong to.